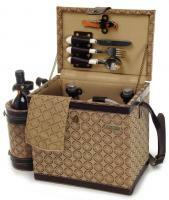 Occasionally you need to spend some alone time with that special someone you love. 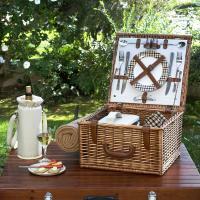 Why don't the two of you share in a nice romantic meal in the park while listening to an outdoor concert, or drink some champagne at the beach while watching the sun set over the ocean waves, with everything you need packed away in a romantic picnic basket from Picnic World? 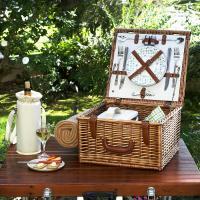 Romantic picnic baskets will make your date, anniversary or marriage proposal even better by carrying the fine food and beverages you love. Take crackers, fruit and cheese, with a favorite bottle of wine fitting snugly inside. 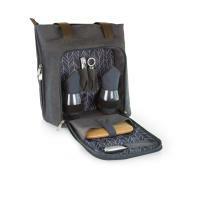 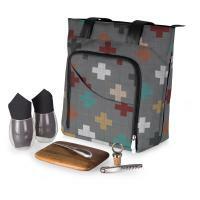 Your glasses, cutting boards, corkscrews and utensils will fit securely in the straps and holders without crowding the food containers. 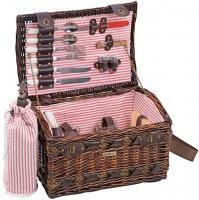 Cold items, such as chocolate-covered strawberries, will keep cool and fresh in the lined bottom while hot foods stay warm when stacked inside. 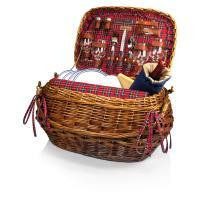 Our romantic picnic baskets already have all the items you need for your elegant time outdoors ÂÂ— all you have to bring along is the food, beverages and the person you love. 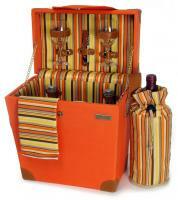 Plus, the fabric lining is easy to clean in case something spills out of a food container. 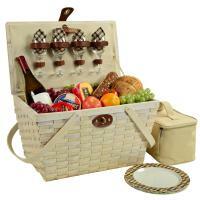 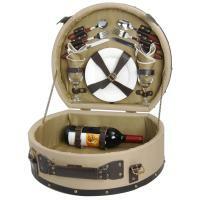 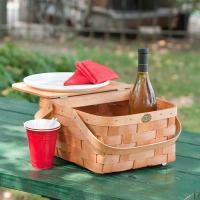 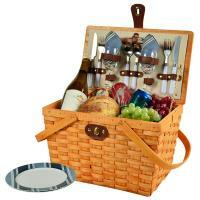 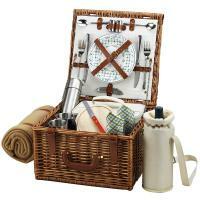 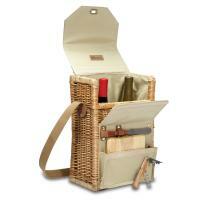 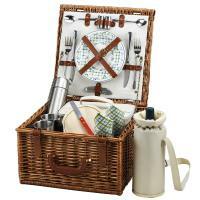 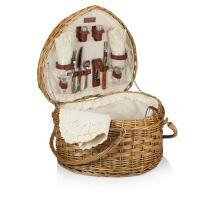 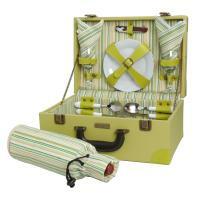 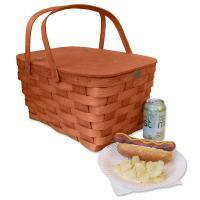 The great thing about romantic picnic baskets from Picnic World is that they fit into any occasion. 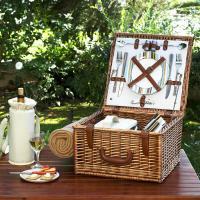 You don't even have to go outdoors to enjoy a romantic picnic meal. 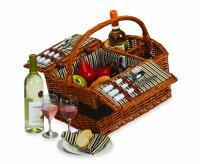 Place all the food and beverages inside the picnic basket, lay a blanket in front of the fireplace, light the candles and enjoy your romantic time together indoors without having to run to the kitchen to bring out the snacks and drinks. 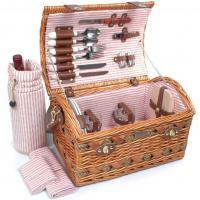 Whatever occasion you want to spice up with someone special, pack away everything you need for a romantic meal inside a romantic picnic basket from Picnic World. 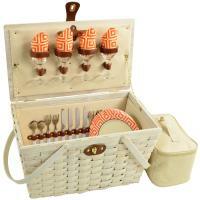 Loved this item - bought for my daughter who lives on the West Coast & can't wait to use it to go to the beach!! This was perfect, I bought this as a wedding gift and the bride loved it.